Legislation has been reintroduced in the Senate that would authorize the United States Mint to produce Saint-Gaudens Ultra High Relief bullion coins in palladium. Details are sparse since the legislation has yet to be published by the Government Printing Office (GPO). The bill, S. 758, was only introduced Wednesday. After holding the modern $20 Double Eagle gold piece and experiencing its sharp detail and stunning beauty, more than one collector would quickly snap up chocolate versions at a candy store, let alone coins in palladium. The high-relief design is that amazing. Should the legislation become law, there is a solid chance the coin will experience far more demand than the 2009 gold piece. Why? Palladium is a silver-white precious metal that is directly above platinum and to the left of silver in the Periodic Table of Elements. While the typical coin collector may not like the palladium color over gold, they will absolutely appreciate palladium’s less expensive price. When the bills were introduced last year, palladium prices had been tracking for several years for about half that of gold. Today and for the last several months, the disparity is far more ranging. Gold has been 4-5 times higher. As an example, today’s gold spot price is $905.00 an ounce. Palladium, on the other hand, is just $221 an ounce. A world renowned coin design struck from a precious metal and under $300 in price? 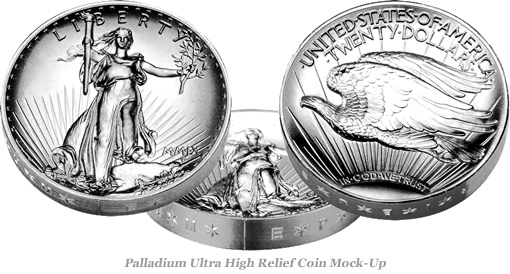 Ultra High Relief Palladium coin sales could… no should, be as spectacular as the design. I’ve heard that in China ‘white gold’ refers to platinum. Palladium deserves that distinction instead. It has identical physical working properties as gold, while at least for now, costing less than white gold in the jewelry trade – that should be called ‘faux white gold’. Palladium isn’t brittle like platinum, nor does it need a rhodium coating against discoloration. So it makes sense to sell set of a palladium and gold St Gaudens, as a marketing tactic for palladium as the true ‘white gold’. However, it seems like they placed more emphasis on it being a substitute for silver that will keep its color. I truly hope this doesn’t get passed. Don’t get me wrong it would be just fine to produce most any other coin in Palladium, just not the UHR Eagle. St Gaudens would roll over in his grave. It’s almost as demeaning as to product it in Silver. Please keep this coin which I view as the most important coin to come out of the US Mint since the halt of circulated gold coins period!. What’s more demeaning is to mint the 2009 Gold UHR Eagle as $20 rather than $50 – or even $100,esp. now that platinum is down to its historic spread with respect to gold. I’d prefer to see no modern $20 one-ounce gold coins whatsoever, if the Pd versions are to have a nominal value of $20.